A study carried out in early 2008 by computer scientists at UC San Diego, led by professor Stefan Savage, and UC Berkeley, found that spammer may be susceptible to attacks that would make it more costly to send junk mail. The online newspaper picked up Calit2's news release about a joint project with Scripps Institution of Oceanography to laser-scan the endangered cliffs from La Jolla to Encinitas. The science news service picks up Calit2's report on the non-invasive spectral scanning of the Italian landmark, part of the CISA3 research initiative. The publication's "The Wired Campus" section report on the green IT memorandum of understanding signed in Montreal earlier in the week. Er dette Kong Salomos miner? Article in the daily Norwegian newspaper about CISA3 associate director Tom Levy's research in southern Jordan. Lee Dye reports on the effort by CISA3's Albert Lin to launch a high-tech, remote sensing search for the burial site of Genghis Khan in Mongolia or China. China View article about CISA3 researcher Albert Lin's project to locate the lost tomb of Genghis Khan. The English language version runs a piece from Xinhua News about CISA3 researcher Albert Lin and his quest to find the tomb of Genghis Khan. The English language version runs a story from Xinhua News about CISA3 researcher Albert Lin and his quest to find the tomb of Genghis Khan. Jon Brodkin reports on the pros and cons of containerized, modular datacenters such as the two purchased by UC San Diego and Calit2. The article quotes Calit2's Tom DeFanti, PI on the GreenLight project, saying that "it will take time to see whether the container approach is more efficient. The whole idea is to create an experiment to see if we can get more work per watts." The Thai online service picks up an ANI news report about Calit2's plans to search for the lost tomb of Genghis Khan using a variety of non-invasive imaging technologies. ANI news agency article about Calit2/CISA3 start of project to search for Genghis Khan's tomb using non-invasive visualization technologies. Nick Miller profiles Calit2 director Larry Smarr and his background as "one of the internet's architects." Smarr is currently in Australia talking to university, industry and government audiences about the need to invest in advanced optical networks to maintain competitiveness. Report on the start of a project in Calit2's CISA center to use satellite and other imaging to search for the lost tomb of Genghis Khan. New center created at UC San Diego, under leadership of Pavel Pevzner, director of Calit2's Center for Algorithmic and Systems Biology, and including Calit2 research Ingolf Krueger. The magazine's online edition quotes Calit2 researcher Albert Lin as saying, "As outrageous as it might sound, we're looking for the tomb of Genghis Khan," using remote sensing techniques and satellite imagery. Report on nearly $5 million NIH award to UC San Diego to establish a new Biomedical Technology Research Center specializing in computational mass spectrometry, led by CASB director Pavel Pevzner. Andrew Trounson interviews Calit2 director Larry Smarr, who is visiting Australian universities to talk up the importance of optical networking to research in many critical fields. The online TV network (a magnet for gamers) has a Future Tech program, and its latest program showcases Calit2's StarCAVE virtual-reality environment, referring to its creators as "the mad scientists at UC San Diego"! Agreement between KAUST and Calit2 at UC San diego for development of world-class visualization and virtual reality facilities and training. Heather Chambers reports on the nearly $5 million NIH grant to fund a center for computational mass spectrometry, led by Pavel Pevzner, director of Calit2's Center for Algorithmic and Systems Biology. AP article as it appears on the MSNBC website talks about allowing viewers new ways to help create art, and quotes Calit2 artist in resident Sheldon Brown, director of CRCA, who says the U.S. has been slower to embrace truly interactive art than Europe and Asia. Da Vinci Hidden Inside a Palazzo Vecchio Wall? Joachim G?rtner reports from Florence, in an interview with CISA3's Maurizio Seracini taped in 2007, on the search for Leonardo da Vinci's long-lost "Battle of Anghiari"... "behind a wall that may hide the greatest mystery of art." Exhibition 'Scalable City' by Calit2 artist-in-residence Sheldon Brown to open at gallery@calit2 on Oct. 23. Ben Potter reports for the weekly Australian publication on pending meetings in Canberra at which Calit2 director Larry Smarr will urge Australian authorities to invest heavily in advanced networking and visualization for the country's research campuses. Writer Miguel Angel Criado reports on how "Californian scientists create a virtual-reality room where they can study from proteins to the stars." Photos and quotes of Calit2's Tom DeFanti and Jurgen Schulze. Calit2 director Larry Smarr "is warning Australian universities to overhaul their campus networks or risk falling behind," according to the Australian newspaper. The Australian newspaper interviews Calit2 director Larry Smarr about his advocacy for much faster Internet speeds to keep Australia competitive in the global tech economy. Writer Ned Randolph reports on the official launch of Calit2's StarCAVE virtual reality environment. Report on launch of Calit2's StarCAVE immersive environment at UC San Diego. The Australian edition of the Gizmodo techie news service picked up the U.S. website's story about the launch of Calit2's StarCAVE virtual reality room. Calit2 unveiled its StarCAVE virtual reality environment. Wilson Rothman reports on the opening of the StarCAVE at Calit2, and includes a photo gallery of the virtual reality room in action. Technology reporter Jonathan Sidener reports on the official launch of Calit2's StarCAVE, and quotes Tom DeFanti and Jurgen Schulze on what makes the virtual reality environment unique. Laura Petersen reports on the work of Maurizio Seracini and Calit2's CISA3 center with the San Diego Museum of Art to prototype a "digital clinical chart" for works of art. "KGTV Channel 10 (ABC Affiliate in San Diego)"
Anchor Hal Clement visits Calit2 at UC San Diego and reports on the official launch of the StarCAVE virtual-reality environment. Video clip runs 2:02; Flash video required. Report on the current research agenda at Calit2's Advanced Network Sciences group, with quotes from ANS co-associate director Tara Javidi. Local newspaper reports on private school's new building that brings the arts and science together, and cites Calit2's Atkinson Hall as an inspiration. In Business editor Peter Day devotes his program to a report on the coming explosion in demand for bandwidth, and interviews experts including George Gilder and Larry Smarr, the latter during a visit to Calit2 in San Diego. Listen to the audio file. Writer Lea Yu reports on the boom in analytics at San Diego companies as well as at Calit2, quoting Lev Manovich, who leads Calit2's Software Studies Initiative to pioneer the use of visual analytics to predict cultural shifts. Calit2 and UCSD are one of eight organizations working within the advanced wireless market that have recently joined the SDR Forum (www.sdrforum.org). The SDR Forum? is a non-profit international industry association dedicated to promoting the success of next generation radio technologies. The North Carolina newspaper picks up the syndicated column of Wall Street Journal writer Robert Lee Hotz, about Maurizio Seracini and Calit2/CISA3's search for a long-lost da Vinci mural, "The Battle of Anghiari". Members of the online computer-science community posted a series of items throughout the week, about the new proposal for a networking architecture put forward by UCSD Center for Networked Systems director Amin Vahdat. Mat Dirjish reports on a research project led by Calit2's Doug Palmer, to establish a Universal Power Adapter (uPower). This obituary for UCSD emeritus professor Manny Farber notes the special event organized by Calit2's filmmaker in residence, J.P. Gorin, in 2006 to celebrate Farber's career as artist and critic. Writer Maria Jose Casado reports on HIPerSpace, Calit2's display that ranks as the highest-resolution tiled display system in the world. Could 'fat-tree' switch setup be key to trimming data center costs? Buying faster switches might not be the only way to amp up performance across data center networks, according to researchers at the University of California, San Diego, who this week proposed a network architecture that would enable commodity Ethernet switches to deliver better performance at a lower cost than their 10 Gigabit Ethernet counterparts. Science writer Darryn Bennett wrote this feature about San Diego efforts to boost telemedicine and telehealth, highlighting numerous efforts at Calit2 and quoting UCSD division director Ramesh Rao. Morley Safer reports on the quest to find "The Battle of Anghiari", a mural by Leonardo da Vinci. The feature also profiles CISA3 director Maurizio Seracini, who is leading the search. Click on link at website to watch video. Don Dodson reports that "if you're going to name something after Larry Smarr, why not a supercomputer?" Calit2 director Larry Smarr visits Central Illinois and a privately-built supercomputer that bears his name, R Smarr, developed by R Systems, Inc. The articles links to a Flash video airing on the Illinois TV station. The online edition of Monash University reports on the launch of a seminar series to the Australian campus over HD streaming video from Calit2, whose director Larry Smarr gave one of the early talks. Science reporter Darryn Bennett reports on the new exhibition in the gallery @ calit2, featuring works by UCSD professors Adriene Jenik and Ricardo Dominguez (and Dominguez's colleagues in the *particle group*). Report on the results of clinical trials of the STRokE DOC telemedicine system for remote evaluation of possible stroke patients. The online medical news service reports on the UCSD School of Medicine's successful clinical trials of STRokE DOC, a stroke-evaluation telemedicine, co-developed and co-funded by Calit2 at UCSD. Science writer Aaron Rowe reports on the School of Medicine-Calit2 STRokE DOC project's clinical trials. Ashley Phillips reports from a conference at MIT, where Calit2 graduate student Derek Lomas discussed an effort to use cheap videogame consoles as entry-level educational computers for children in India and other developing countries. Report on the research in the Machine Perception Lab on "intelligent tutoring systems". The environmental news service reports on the weather station project, involving students and mentors including Calit2's Doug Palmer and Bill Hodgkiss, as well as Jacobs School professor Jan Kleissl, with partial funding from the Calit2-based Environment and Sustainability Initiative. Writer Ned Randolph reports on the $2.6 million GreenLight project, with primary funding from NSF, to create a testbed for improving energy efficiency of computing. Writing in this blog, Ari Allyn-Feuer reports on the latest in storage and IT topics, including the GreenLight "green" project funded by NSF and Calit2 at UCSD. "U.S. News and World Report"
A research team at UCSD has just unveiled the largest screen system in the world: almost 32-feet wide and 7.5-feet tall with 287 million pixels of screen resolution. That's more than one active pixel for every U.S. citizen, according to the 2000 Census. In its Building & Design section, the environmental news site reports on the GreenLight project, funded by NSF and Calit2. Do You Care Who's Watching You? Host Tom Fudge interviewed UCSD professor Mohan Trivedi about issues of surveillance and security, notably in the context of cameras in public spaces. The UPI news service reports that "scientists and engineers at the University of California-San Diego said they are building an instrument to test the energy efficiency of computing systems under real-world conditions." Kathleen Hickey reports on a $2 million NSF grant to Calit2 at UCSD for the GreenLight project. The article quotes Calit2 director Larry Smarr, and Tom DeFanti, PI of GreenLight. The Lost Da Vinci Art Work"
Writer Huang Xin reports (in Chinese) on the search for da Vinci's "Battle of Anghiari" by CISA3 director Maurizio Seracini at UCSD. In the publication's The Wired Campus section, writer Maria Jos? Vi?as reports on Calit2's GreenLight $2.6 million project, an experiment "to test and improve the energy efficiency of computing systems used for scientific research". The authors Kevin D. Franklin and Karen Rodriguez'G examine computational tools and approaches at the interface of humanities, arts and social science -- notably Lev Manovich's cultural analytics project in Calit2's Software Studies Initiative at UCSD. The magazine's online service reports on Calit2's GreenLight project to build "an advanced data center to test the energy efficiency of computing systems under real-world conditions." The software-developers' portal highlights the announcement of Calit2's GreenLight project to deploy an NSF-funded testbed for energy efficiency in large-scale computing data centers. This report in Russian is apparently based on Calit2's news release about the recently deployed HIPerSpace system becoming the world's highest-resolution computer display. The Georgia-based publication's website picked up Calit2's news release about the 286-million-pixel HIPerSpace display wall at UCSD. The European Electronic News service picks up the report from TechRadar.com on the launch of the HIPerSpace display at Calit2. Report on research as part of the Calit2-based Pacific Rim Experiences for Undergraduates (PRIME) program in Beijing, to use cyberinfrastructure to cull for potential weapons against avian influenza. Calit2-based Lily Cheng, a researcher in the National Biomedical Computation Resource (NBCR), is the first author on a journal article on the success of a team using cyberinfrastructure tools to identify potential compounds in the fight against avian influenza. NSF's Leslie Fink reports in the magazine's online edition about the avian flu research at UCSD, SDSC and the PRIME program. The article links to a video produced by Calit2, featuring first author Lily Cheng, a former PRIME undergrad researcher in Beijing. The news service picks up Calit2's news release about the launch of the expanded HIPerSpace 286-million-pixel display system. Article based on last week's Wall Street Journal feature about UCSD's Maurizio Seracini searching for "The Battle of Anghiari" was one of the top news stories this Sunday on AOL worldwide. France's arts channel, seen throughout much of Europe, aired the 80-minute documentary about Maurizio Seracini's work on two Leonardo da Vinci masterpieces -- originally aired on Britain's Channel 4 in 2006. Science columnist Robert Lee Hotz reports on the search for da Vinci's "Battle of Anghiari" mural, led by CISA3 director Maurizio Seracini. Marc Chacksfield reports on the launch of Calit2's HIPerSpace -- the largest scientific visualization display in the world. Jeffrey Young report on UCSD and Calit2 launching the HIPerSpace tiled display wall... the highest-resolution display system in the world. Item on use of world's highest resolution display, Calit2's HIPerSpace wall, as "the size of complex scientific data sets grows exponentially." Sean Fallon of the widely-watch tech blog reports on the new Calit2 HIPerSpace display sytem. In the magazine's Blue Marble Blog, environment correspondent Julia Whitty reports on the concept of Calit2's Doug Palmer to create a Universal Power Adapter that would save energy... and make it easier to power consumer electronic devices. The newspaper's online version picked up the Calit2 news release about Doug Palmer's plan for a Universal Power Adapter that could revolutionize the way we power our electronic devices. The science and technology news service triggered a series of comments from readers in response to the report on Calit2's Universal Power Adapter project, led by project scientist Doug Palmer. In a report on "local superlatives," columnist Logan Jenkins highlights the "World's Largest High-Def Display ? Constructed at UC San Diego in a joint program with UC Irvine, the two HIPerSpace screens boast a combined 440 million pixels of resolution, which is a world apart from your plasma TV." Writer Rachel Veroff reports on technologies being developed in the UCSD Machine Perception Laboratory at Calit2, for "intelligent tutoring systems" that use facial recognition to gauge how well a student is learning. From Los Angeles, the Chinese news agency reports on an article in the Journal of Medicinal Chemistry by researchers at UCSD, including lead author Lisa Cheng, who first began the research as a summer PRIME intern in Beijing while still an undergrad at UCSD. A similar article appeared in OneIndia.com at http://living.oneindia.in/health/science-study/2008/bird-avian-flu-drug-candidate-040708.html. Report on Pavel Pevzner's undergraduate bioinformatics program at UCSD, funded with his $1 million HHMI fellowship. The undergraduates are pioneering a new field of proteogenomics. Pevzner directs the Calit2-based Center for Algorithmic and Systems Biology. The Australian gaming news service reports on the posting of videos from the SoftWhere workshoip at Calit2. The news service posts a news release about the Pacific Rim Experiences for Undergraduates (PRIME) program co-funded by NSF and Calit2. Report from TeraGrid '08 on Calit2 director Larry Smarr's appeal to university campuses to "remove network bottlenecks to supercomputer users." Calit2 and CASB participant Glenn Tesler is quotes in this article about the origin of the genetic code, written by Davide Castelvecchi. Tesler is a professor of mathematics at UCSD. Science editor Roger Highfield reports on potential dangers from robots designed to teach or care for toddlers; the article mentions that "robots are a great teaching aid," and notes that the Calit2-based Javier Movellan, of the Machine Perception Lab, has developed RUBI for early childhood education. Calit2 visualization director at UCSD Tom DeFanti is quoted in this article about Darkstrand, Inc.'s purchase of bandwidth on the National LambdaRail. Calit2 participant and UCSD electrical engineering professor Bhaskar Rao is featured in this interview with writer Jack Germain. Rao is quoted as saying that "space is the new dimension in communication." Writer Katherine Bourzac reports on the technology developed by UCSD's William Trogler, with funding support from Calit2. It's an "explosives detector that uses luminescent polymers [which] is being field-tested in Iraq. Phillip Torrone posted Calit2's Gizmo video and a short description of the project, as featured on the institute's Calit2ube channel on YouTube. Simon Bisson and Mary Branscombe report from the FiRe conference and mention Calit2 director Larry Smarr's role in the brain trust exercise to find technology solutions for responding to wildfires. Chancellor Brady Deaton bestowed an honorary doctorate upon Larry Smarr, a former University of Missouri graduate and a pioneer in telecommunications. Calit2's Larry Smarr will deliver a keynote speech to an upcoming meeting of the Association of University Research Parks, hosted by the UCSD Science Research Park and set to take place June 16 at the Salk Institute. The news service picked up Calit2's release about the initiative of Calit2 researcher Shannon Spanhake to develop a low-tech solution to carrying water in rural India. Hugh Hart reports on the current show in the gallery @ calit2 in Atkinson Hall, where artist Marie Sester's "Exposure" raises "questions about technology-empowered invasions of privacy." UCSD Calit2 participant Henrik Wann Jensen's work in computer graphics and realistic simulation of milk and skin is profiled by columnist Bryn Nelson. Michelle Mowad reports on the upcoming inaugural workshop of Calit2's Software Studies Initiative at UCSD, where scholars will "convene to study computers' role in society and business." The website for physicists and other scientists reports on work done by a team at the Jacobs School of Engineering, using Calit2's Nano3 cleanroom facility to build test circuits for slowing light. Pavel Pevzner, director of Calit2's Center for Algorithmic and Systems Biology (CASB), is quoted in this article by Rick Weiss about birds -- not reptiles -- being the closest living relatives to dinosaurs. The journal of the international society advancing an interdisciplinary approach to the science and application of light takes note of a 60 minutes piece on the work of Calit2's Maurizio Seracini. Report by Morley Safer about "an art detective's quest to find a lost Leonardo da Vinci masterpiece," featuring UCSD's Maurizio Seracini who leads the project. Article and video. Blog post by UC Davis phylogenomics expert Jonathan Eisen after a CAMERA meeting and tour of Calit2 at UCSD. Freelance writer Francis Rocca reports on the efforts of Calit2's Maurizio Seracini to find a long-lost mural by Leonardo da Vinci. AnnaMaria Stephens reports on a San Diego Museum of Art exhibit called "Inside the Wave," including exhibits sponsored in part by the UCSD division of Calit2. Writer Jeffrey Young follows up a January article with some conclusions about UCSD (and Calit2) professor Noah Wardrip-Fruin's experiment with blog-based versus traditional 'blind' peer review of academic books. Calit2's Maurizio Seracini will be one of the speakers April 7 on the Renaissance panel that is part of the 26th annual Conference on Computer Human Interaction (CHI 2008). Quotes Pavel Pevzner, director of Calit2's Center for Algorithmic and Systems Biology. Education writer Tanya Sierra profiles a course taught from India by Calit2 researcher Derek Lomas, on developing technologies for developing countries. Calit2's Doug Palmer and its Gizmo technology is mentioned in this video and web article about campus emergency-response systems at UC San Diego. The Calit2-affiliated CineGrid project is one of five winning groups awarded CENIC Innovations in Networking awards today. Uttara Choudury reports for the international news service on a course at UCSD, hosted by Calit2, taught from Mumbai, India, by lecturer Derek Lomas, a researcher with the California institute. 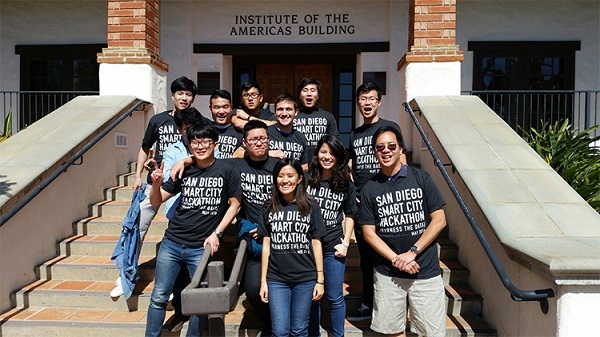 The Chinese news agency reports on the UCSD center with Salk Institute that will be supported on the IT side by Calit2 and San Diego Supercomputer Center. As reprinted in the Thaindian News online service, the news agency reports on the latest efforts of Calit2's Maurizio Seracini to discover a long-lost Leonardo da Vinci mural. The ANI story also appeared on TheCheers.org international news agency at http://www.thecheers.org/news/World-news/news_14396_Mystery-of-Da-Vincis-lost-masterpiece-close-to-being-cracked.html. Malcolm Moore reports from Rome on the effort to find the "Battle of Anghiari" mural, led by UCSD's Maurizio Seracini. The city of Florence and National Geographic Society announced a 5-year agreement, including plans for a TV documentary about the Anghiari project led by UCSD CISA3 director Maurizio Seracini. "City of Florence News Release"
A researcher from Calit2, Derek Lomas, is teaching a course from Mumbai, India -- although the students participate from a conference room in Atkinson Hall on the UCSD campus. Calit2's HD concert video filmed at the November world premiere of "Sanctuary", by institute composer in residence Roger Reynolds, is previewed. The screening takes place Feb. 28 in the Calit2 Auditorium. New York correspondent Philip Sherwell makes Maurizio Seracini, CISA3 and UCSD the center of his feature on efforts to discover lost historic "wonders" of the world. Also included: a 2-minute video clip from CISA3 on the search for the "Battle of Anghiari". Angelika Franz writes that a team of scientists at University of Michigan wants to approach CISA3's Maurizio Seracini to participate in the Anghiari project to test their teraherz scanner. The newspaper's TV columnist reports on the showing of "The Da Vinci Detective" on the Discovery Channel... about Calit2's Maurizio Seracini, director of CISA3. This article focuses on one participant in the CineGrid project: RENCI, based in North Carolina, which has developed a tele-immersion room that serves as its node on CineGrid. Reporter Bill Rettew covers the GLEON 6 meeting of the Global Lake Ecological Observatory Network, a group co-founded by Calit2's Peter Arzberger, a member of the GLEON Steering Committee. David Goll reports on competition for the Bay Area's 511 service from Calit2's California Wireless Traffic Report; quotes Traffic Report developer Ganz Chockalingam. Report on UCSD professor Noah Wardrip-Fruin's decision to post his next book on a blog, to get input from other researchers in the editing process -- a plan that has raised eyebrows in the academic publishing industry. Andrea Siedsma reports on telemedicine and telehealth projects at Calit2, and quotes Calit2's Ramesh Rao, Philip Rios and others. Calit2 UCSD acting director Bill Hodgkiss ticks off some of the key research areas for the institute this year, including cyberinfrastructure-enabled science. The popular art blog -- based in Italy -- features an article about the gallery@calit2's first exhibit, a 9-foot-tall interactive Atari joystick, by artist Mary Flanagan. Calit2 division director Ramesh Rao is quoted in Jonathan Sidener's feature about the revolution in new wireless technologies that will impact the consumer. Larry Smarr to speak at 15th Mardi Gras Conference hosted by the Louisiana State University Center for Computation and Technology. Computerworld's Darren Pauli reports on a partnership between Calit2 and University of Melbourne under which research scientists, doctors and academics will be able to share more research and technology through the OzIPortal. Matt Chapman reports that UCSD and the University of Melbourne "have created a dedicated fibre-optic link to allow video-conferencing with no interference from other traffic." Political editor Peter Hartcher reports that a new super-broadband link between Calit2 and the University of Melbourne may push Australia to deploy more fiber optic to the nation's homes and offices. Calit2's Larry Smarr is quoted. Calit2 at UCSD and University of Melbourne launch the OzIPortal for long-distance, super-broadband collaboration. Quotes Calit2's Larry Smarr as saying the "key to the project was bringing together the research capability with political leaders keen to make a commitment." Also published on Australian IT.